33 Crosby Street in Soho and thus declaring this New York City spot its new home away from home. The New York outpost is a labor of love. Conceptualized and designed by Saiger himself, the 950 sq ft space was completely gutted to bring out the bones of the building. Architecturally, the interior is clean and minimalistic with a Scandinavian beach house feel while hints of the building’s historical details shine through. Sticking to a color palate of white, light grey and slate, an exposed brick wall was painted over and antiqued. The opposite wall is paneled in Italian ceramic tile, which is also used for the flooring. Choosing to use the same material on the wall and floor combined with additional details such as custom wrought iron windows and doors (one of which showcases a neon MIANSAI sign that hangs from the building next door) opens up a narrow space into an inviting store. From jewelry to timepieces and the recently launched leather goods category, the store will house the entire MIANSAI collection. A ‘build-your-own’ station adds an interactive element to the space, allowing customers to select materials and hand make HOOK, ANCHOR and BRUMMEL bracelets, as well as personalize leather items with a custom embossment. The brand will also be expanding into home goods on a small scale, offering scented candles and soaps, all of which will incorporate the signature nylon rope the brand is known for as a decorative element. 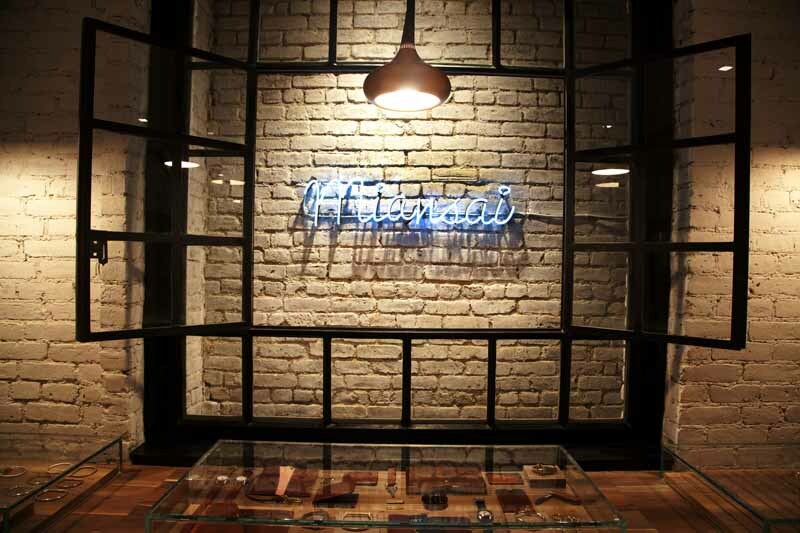 When Saiger envisioned what the MIANSAI Flagship would entail, he pictured more than a traditional retail store. “I wanted to create a place that would add to the neighborhood and enhance the community; a place where one could not only shop, but make stopping into the store a part of their daily routine”, Saiger commented. MIANSAI by Michael Saiger isavailable in the U.K., France, Italy, Spain, Germany, Denmark, Japan, Hong Kong, Singapore, SouthKorea, Australia, Turkey and the United Arab Emirates, in addition to its online channel: www.miansai.com.